The history of paper production is very long. The Chinese produced paper made of hemp as early as 3000 B.C.E. They later added linen as material too, and papermaking gradually spread to the Middle East. From there the Arabs brought paper to Europe; the first European paper mill is dated around the 11th century in southern Spain. The enormous development of papermaking started hand in hand with the invention of book printing in the mid-15th century. Before that maps and books were copied by hand, which was such a time-consuming process that it did not allow publishing of the books and maps in larger volumes. Book printing changed this all dramatically. It allowed an almost unlimited number of copies and information of all kinds began to spread fast. Maps became easier to access, which played an important role during the Age of Discovery and the subsequent colonization of the discovered territories. How had paper been made prior to the early 19th century? The original material for paper making was old rags, in particular linen and hemp rags; cotton rags imported from the colonies were used later too. The rags were put in water for a period of several weeks, until the textile fell apart into individual fibres. 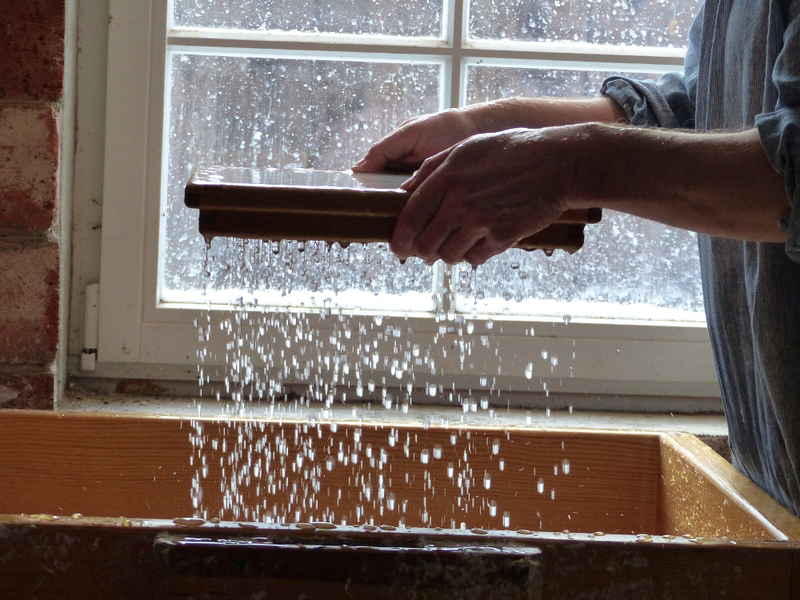 Next, this mass was milled, diluted and put on a fine sieve which determined the size of the resulting paper sheet. The superfluous water ran off and the wet paper sheet was overturned onto a piece of felt. Several sheets of papers and felts were layered on each other and the pile was then pressed with a hand press to get rid of more water. The pressed sheets were dried and then soaked into glue in order to improve the characteristics of the paper’s surface (so the printer’s ink didn’t blur on the sheet). 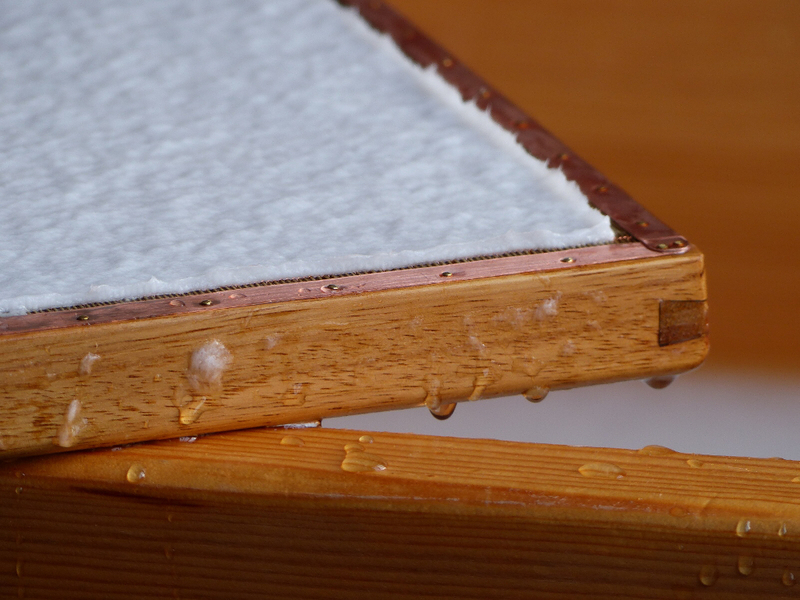 Glued sheets were transported back to the drying room. As a last step of the papermaking process, the sheets’ surface was smoothened in a simple machine that functions similarly to a mangle. Very often the final sheets had the mark of the manufacturer that had produced them. Until the beginning of the 19th century, paper had been solely a handmade product. The resulting products were individual paper sheets. This changed in 1806 when the Fourdriniers brothers invented a machine that enabled the mass production of paper in rolls. A demand for paper had increased rapidly in both Europe and America and the supplies of linen, hemp and cotton had become insufficient. A shortage of rags made the paper production a very expensive business and efforts were made to switch to another material. During the industrial revolution, the use of lye quickly spread and this was an important factor in the modification of the papermaking process. Lye would decompose a wood pulp and therefore wood, which was cheaper and more accessible than old rags, became the new source for paper production. The mass production of paper made of wood pulp began in Germany and Canada in 1840s. Since then, several steps in improving the chemical infusion to decompose the wood have been taken; from 1870 a mixture of hot water and sodium sulphide and sodium hydroxide was used for the wood pulp break down. Paper made of linen, hemp and cotton is still made today. It is a handmade, piece production and that is why handmade paper cannot compete with the industrially produced paper in price or accuracy of the size. 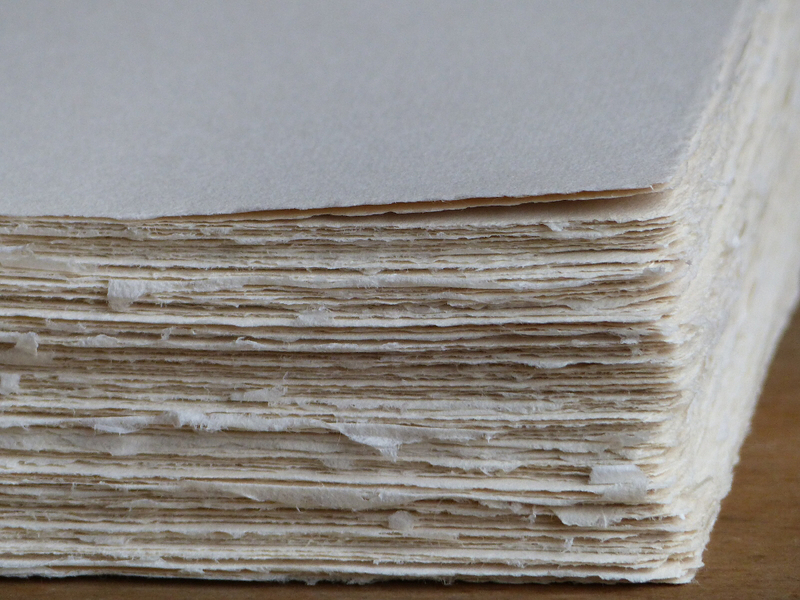 Each individual sheet of a handmade paper is unique. The resulting sheet properties can be affected during production. Different drying methods influence the surface of the paper. The color of the paper is determined by the composition of the pulp, both bleached and unbleached, and can be combined in different ways to achieve the exact shade a customer desires. For decoration, other fibres or dried flowers can be added to the pulp.The use of handmade paper has shifted towards documents of a representative character or towards art and design. It is ideal for graphics, paper installations, and collages. It can be also printed on; because of its unique appearance, it is used as a material for wedding announcements, diplomas or certificates. Invitations and other types of official documents are printed on handmade paper by companies and presidential and government offices. As has already been discussed, handmade paper and old maps simply belong with each other. That is why we love handmade paper so much in Kobeica and use it for all our prints. We print reproductions of maps that were, in most cases, originally printed on handmade paper when they were first published. This makes our reproductions very authentic; the handmade paper suits them well. We use a non-bleached mixture of linen and hemp, and this shade gives an ancient look to our vintage maps. As a result, this is a wonderful product that can decorate your wall for many decades to come.